Happy New Year, a Norman Rockwell painting, appeared on the cover of The Saturday Evening Post published December 29, 1945. This is another favorite of Rockwell collectors, a classic enduring image of the world Rockwell painted. An alternate title for this painting is Party's Over. This painting was Rockwell's 236th overall out of 322 total paintings that were published on the cover of the Saturday Evening Post. Rockwell's career with the Post spanned 47 years, from his first cover illustration, Boy With Baby Carriage in 1916 to his last, Portrait of John F. Kennedy, in 1963. This was also the tenth cover for The Post in 1945. In 1945, there were ten Norman Rockwell Saturday Evening Post covers published. The location of the original oil on canvas painting is unknown. on page 164 of Norman Rockwell, A Definitive Catalogue by Laurie Norton Moffatt. Several studies also appear in the Norman Rockwell Catalogue on pages 164 and 165. Pristine original copies of this magazine cover routinely sell for big bucks on eBay, when it is offered. And to think it only cost ten cents originally! And it was mint condition then, too. In this Norman Rockwell painting, we see the aftermath of the first New Year's Eve party after the end of World War Two. This was a time of great celebration in America. Many troops had returned home. Many families had lost sons, fathers and husbands in the war, but at least the uncertainty caused by the war had concluded. As always, some had more to celebrate this New Year's than others. This scene is the same as it is after most organized parties. The guests pay a fee, sometimes exorbitant, sometimes reasonable, to be at the party. The party is already decorated when the guests arrive, and no one has to stay to clean up. 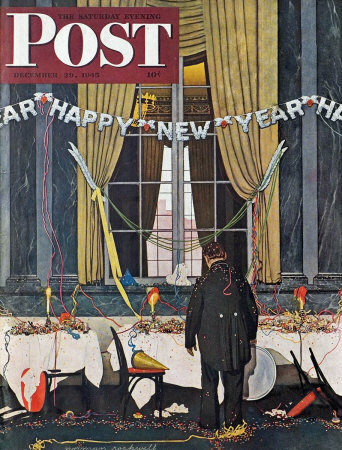 Happy New Year was only one of 322 Norman Rockwell Saturday Evening Post covers; Here is the list of Norman Rockwell Saturday Evening Post cover illustrations. Well, no one is not quite correct. Someone always has to clean up the mess. The someone cleaning up this mess is clearly dreading his task. This waiter, portrayed by Anton Ashenbrenner, is clearly disheartened by the huge job before him. His shoulders slump a bit when he looks at his chore. I do not envy him one bit. Do You Have A Great Story, Opinion Or Contribution About Happy New Year?